A pair of COLLEGE FOOTBALL Conference Championships dominated Saturday primetime, both providing entry for the winners into the year’s COLLEGE FOOTBALL PLAYOFFS. At least in preliminary numbers, FOX’s Michigan State vs. Iowa game (2.6) topped ABC’s Clemson vs. North Carolina (2.4). 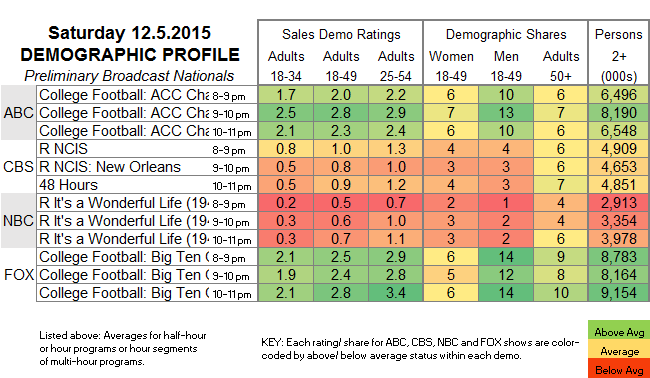 NBC’s annual airing of IT’S A WONDERFUL LIFE, at 0.6, was about where it was last year (when it also faced Conference Championship games), while CBS featured 1.0/0.8 reruns and then a 0.9 episode of 48 HOURS. THE LEFTOVERS airs its probably enigmatic season finale tonight on HBO, and ABC’s ONCE UPON A TIME has its fall finale. NOTE that in much of the country all broadcast network programming (at least the non-football kind) will be pushed to cover President Obama’s speech to the nation about terrorism and the San Bernadino shootings.